Are there graffiti on the exterior walls of your home, restaurant or pub? Does the patio in your garden or the parking lot outside your office building look tired? We can help out providing you with refreshed exterior hard surfaces at prices that will fit every budget. The professionals from Gutter Cleaning London have removed graffiti, signs of air pollution and stains of external hard surfaces of home and offices all over London for a long time. You will be left with refreshed, great looking property, that will stand out on the street. The trained cleaners will come fully equipped to apply our effective pressure washing technique, that has proven to deliver amazing results on dirty exterior hard surfaces. You can book a visit with the London jet washing team Mondays to Sundays and evenings, at the same price. And in case you want your property's exterior to undergo full transformation, get the window cleaning team come along the jet washing experts. So, call 020 3746 2958 and let the experts get the job done! What Other Perks You Will Enjoy? Along great looking property facade, we also deliver quality insured gutter repairs as well. 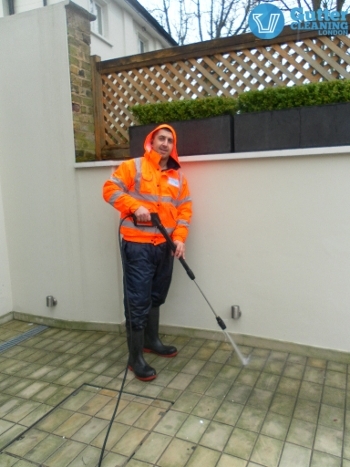 How To Book First Class London Jet Washing? Get your property's exterior polished on a budget, by calling 020 3746 2958 now! We have a team of friendly customer advisers ready 24/7 to help you find the right service for your needs and order it. If you prefer to contact us online, you can do so by using our contact form and live chat feature. Get in-touch any time for free quotes on your pressure washing needs.